Oh, all right - I won't keep you-all guessing any longer. June's Where in the West (WITW) is the rather large, dry lake bed or playa known as the Black Rock Desert - and, oops, I had my directions a little confused: the main axis of the Black Rock Desert runs southwest to northeast (not east-west as I often envision it when I'm out there without having looked at a map prior to going - not, btw, recommended - going without a map, that is). Photo two from June 2 was taken near Cholona siding on the Western Pacific Railroad, looking almost due north at Black Rock Point, the formation of rock after which the Black Rock Desert is named. Photo one from June 2 was taken near Trego Hot Springs looking approximately northwest. Photo one from June 5 was taken in the "center" of the desert north of Trego Hot Springs, looking northeast. Photo two from June 5 was taken from the same location, looking approximately north, with the Calico Mountains in the background. Winnemucca lies many miles east of the desert proper. A wide, graveled, often washboardy (and sometimes horrendous) dirt road connects Gerlach and Winnemucca. 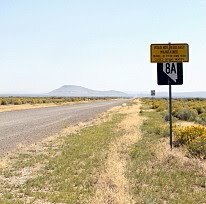 The road is currently known in it's entirety as the Jungo Road, according to various county road maps available at Nevada DOT, but it's been shown by two route numbers in the past, with the 1941 state road map showing the entire route as S.R. 49, and with the 1976-77 road map showing S.R. 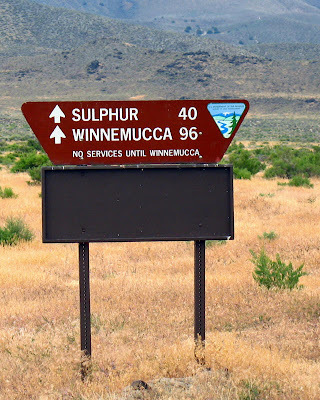 49 going from Highway 95 just north of Winnemucca to Sulphur, and S.R. 48 going from Sulphur to S.R. 34 (now 447) just south of Gerlach. If the desert is okay for travel, take the desert to Trego — Trego siding and Trego Hot Springs are within a mile or two of each other — and then get off the desert and on to the gravel road. It may be possible to drive farther on the desert toward Winnemucca, but don't do it on my account. If you are out in the "middle" of the desert and head rambunctiously toward Gerlach - and forget to turn right to get on the pavement (which would be S.R. 34 heading north toward, well, nowhere) - you will run into mud. This operation is most often undertaken at night, when heading straight for the lights of Gerlach might seem like the shortest distance between two points. It's not. It takes a long time to get unstuck out there, and your buddies won't know where you are, because they most likely remembered to follow the main tracks. When I say "middle," I'm really thinking of an area about half way between Black Rock Point and Gerlach, or maybe closer to Gerlach. If you drive too far to the northeast toward the sink of the Quinn River, you are very likely to get stuck, if not also lost. Take it easy out there! And seriously, when traveling around in any of this country even on the paved S.R. 34 heading north - past the dirt turn-off to Soldier Meadow, past the old Hog Ranch gold mine, and eventually to Vya - be well prepared for either hot or cold weather extremes. The area north of Gerlach and somewhere east of Vya is where the Stolpa's got lost and almost died while crossing through the wrong part of the world to take a short cut. If you are in Gerlach, stop at Bruno's - either the restaurant or the gas station - and get the low-down on whether the desert is okay to drive on, and get some ravioli while you're at it. I don't know who you could check with in Winnemucca. John C. Fremont and Kit Carson passed through in 1843-1844. The Applegate brothers in 1846 and then Peter Lassen in 1848 more-or-less created the Applegate-Lassen Trail - a cutoff from the established Orgeon Trail (not necessarily a better trail). The Nobles Cutoff was established in in 1851 by William H. Nobles, that trail being essentially the present back road from Gerlach to Susanville. That is not a road to take during rains or wintertime or without two spare tires. It's a fairly well-traveled route, traveled by Gerlachians and local ranchers, but it can be quite rocky. Extremely. You, my readers, will have to do the research necessary to find where all these historic routes actually pass through the desert. The name: It's common knowledge that Black Rock Point, after which the Black Rock Desert is named, is made of black limestone. Maybe I've been there once. Maybe. I couldn't find any "reliable" resources about the limestone; there are, however, several miscellaneous references to this well-known fact. The link above states that the limestone is more than 300 million years old - I have no idea about that. The desert is huge, it spans least three counties, no mean feat in Nevada, the land of large counties. 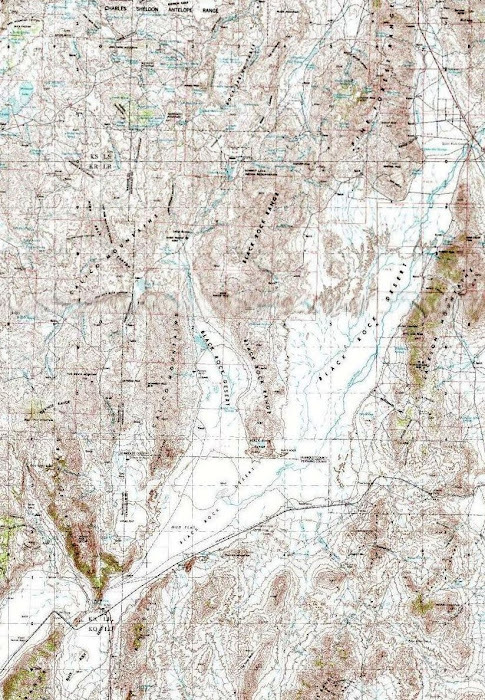 The Washoe, Churchill, and Pershing county geologic maps and reports (NBMG Bulletin 70, Bulletin 83, and Bulletin 89) can be purchased here; all county maps can be downloaded here (a huge file). It's the Pershing County report that would answer questions about the limestone. 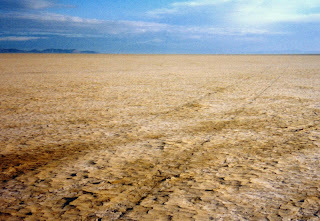 Playas and the desert: Andrew talks about dry lake beds and what you can do with them (on them?). More history: and more about the Black Rock Desert in general. Hot springs: Desert Woman on the Road has photos of Black Rock Hot Springs, which is at the western base of Black Rock Point. She also has some photos of other hot springs in the area. The desert has numerous hot springs around it's edge and within driving distance (well, everything is within driving distance). Many of these springs are extremely hot, and people have been known to die in them. Always check a new spring out carefully, not by jumping in. Always keep your dogs in the truck or on a leash - and don't jump in after them. One woman has died doing that. Really, the dogs aren't worth it. Read these precautions. Quinn River: not much info is available. Sign near the west end of the dirt road from Gerlach to Winnemucca (the dirt road begins on S.R. 447 between Gerlach and Empire). Look behind the sign - are those old shorelines? I drove across Black Rock playa once and it was surreal ... I can see the draw of a place like that. A few years back, I participated in a research project at my alma mater where some seismic-reflection lines were acquired across the northeastern part of Nevada - I was one of the many on the 'crew' deploying/collecting geophones. And then we also installed some passive recorders too. I think a paper came out in GSA Bulletin this year with those results ... I'll have to look it up. "During my time at UNR I never made it out to the Black Rock, but I wanted to...."
It's not too late. It's still there. Get moving. Geotripper (MJC), you've been told "what for" by Anonymous here in this thread. It sounds to me like The Black Rock Desert *should* be on your list of things to see before you die! So, yeah, get out there! I hate that word "should" - I also hate "things to see before you (one/whoever) die" - just sayin. The Black Rock is equal to Death Valley. Have made the trip 10 times or so and always find something new. The drive from Sacramento is well worth it. Yeah, the Black Rock is great! Just noticed that the new Blogger has made the photos match up strangely with the text. Oh, well.